First came Swatches. Then came Crocs. 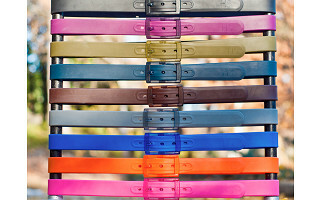 Now, plastic takes another stylish step forward into the belt world. 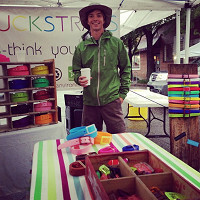 Made from 100% recyclable thermoplastic materials, Huckstraps add a pop of color and personality to any outfit. Dustin Vann, the founder of Huckstraps, isn’t trying to re-invent the way the belt works; he just wants to change the way it looks. Available in a wide range of bright, bold colors, as well as a selection of more subtle hues including black and brown, Huckstraps turn an everyday accessory into a statement piece. Huckstraps are 45 inches in length and are fully adjustable. Simply unlock the clamp, cut, and trim. The buckles are interchangeable, so if you purchase more than one belt, you can mix and match to create your own color combinations. Whatever your size, whatever your gender, Huckstraps are sure to fit your body and your sense of style. I’m very excited to share HUCKSTRAPS with you here on The Grommet. We’re certain the HUCKSTRAP will quickly become your favorite most versatile belt, no question! The Huckstrap is made from 100% recycled materials, and is manufactured in every step with style, durability, and quality in mind. Each strap is cut to a standard 45" which makes for a one size fits all approach. That's right! It can fit almost anyone! All you have to do is measure, cut, and clamp the HUCK (buckle) and you've got the perfect fit! You can also purchase multiple colors, and easily switch HUCKS and STRAPS to create your own unique color combinations. The HUCKSTRAP offers a great custom fitting design for men, women, and even children! We hope you enjoy THE HUCKSTRAP as much as we do! From everyone here at HUCKSTRAPS - AIEBA!! AVERAGE IS EASY. BE AWESOME! Dustin, Have you ever thought about promoting these belts to individuals that have nickle allergies. We are always looking for a belt that does not have any metal that touches the soft skin of belly area of kids. Just a thought my friend. Is there any way to know what type of "thermoplastic" the belts are made from? Do they have PVC in them? BPA? Any type of guarantees regarding content? Good questions. I've just contacted Dustin to be certain that he answers this question. @Susan The belts are 1 1/4'' wide, and the buckles are designed to lay flat against the strap. If you're worried about "bulkiness" in the buckle, rest assured that we've worked through several prototypes and designs to make this buckle very sleek and stylish. @Susan The straps are 1 1/4'' wide, and the buckle is designed to lay flat against the strap. If you're worried about bulkiness in the buckle.. Rest assured that we worked through many prototypes and designs to ensure that the buckle is sleek, stylish and highly functional all at the same time! First came Swatches. Then came Crocs. 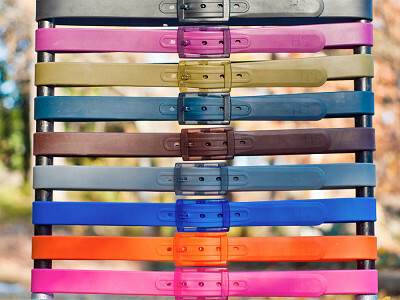 Now, plastic takes another stylish step forward into the belt world. Made from 100% recyclable thermoplastic materials, Huckstraps add a pop of color and personality to any outfit. Dustin Vann, the founder of Huckstraps, isn’t trying to re-invent the way the belt works; he just wants to change the way it looks. Available in a wide range of bright, bold colors, as well as a selection of more subtle hues including black and brown, Huckstraps turn an everyday accessory into a statement piece.